Summer arrived with a vengeance; in the first three days of the month, temperatures reached 31⁰C and humidity was up to 95%. There was heavy rain mid-morning on 4th and the weekend of 6th/7th was hot, humid and polluted. The month began with a mega-rarity, an Oriental Dwarf Kingfisher at Po Toi on 1st and 2nd. This is only the second Hong Kong record, the first being one seen briefly at Tai Po Kau on May 7, 2015. Seven Short-tailed Shearwaters were seen from a boat in southern waters on 3rd and four were noted sitting on the surface of the sea from the Po Toi ferry on 4th. There were a few passage migrants elsewhere in the territory. On 1st, eight Blue-tailed Bee-eaters, four Oriental Dollarbirds and a Brown Shrike were at Tai Sang Wai and a Chinese Sparrowhawk was at Tai Lam Country Park. Other birds at the latter site included a Speckled Piculet and six Hodgson’s Hawk Cuckoos calling. A pair of Chinese Grassbirds and three Upland Pipits were recorded in the Pat Sin Leng range. A Lesser Cuckoo was at Ng Tung Chai and two Two-barred Warblers at Wun Yiu on 2nd. Before the rain came down on 4th, a White-throated Needletail, a Chinese Sparrowhawk and 16 White-winged Terns were seen at Mai Po. Forty-five White-winged Terns, five Whiskered Terns and a Black-faced Bunting were recorded at San Tin on 5th. Nothing of particular note was reported on the weekend of 6th & 7th. A couple of additional records of interest for the period under review have recently (May 8th) appeared on the HKBWS website. Both sightings were from Long Valley, a site which has been rather quiet of late: they involved a Baillon's Crake on 2nd and a female Von Schrenck's Bittern on 4th & 5th. There was a focus on seabirds (mainly terns) during the period under review. On 9th, a Short-tailed Shearwater, 39 White-winged Terns, a Whiskered Tern, plus locally-breeding Bridled & Black-naped Terns were seen from the Po Toi ferry. A boat trip to southern waters on 11th turned up five Short-tailed Shearwaters, 19 Aleutian Terns, two Greater Crested Terns, 28 White-winged Terns and 13 Bridled Terns. Over a hundred marsh terns, mainly White-winged but including some Whiskered were in the West Lamma Channel on 12th. 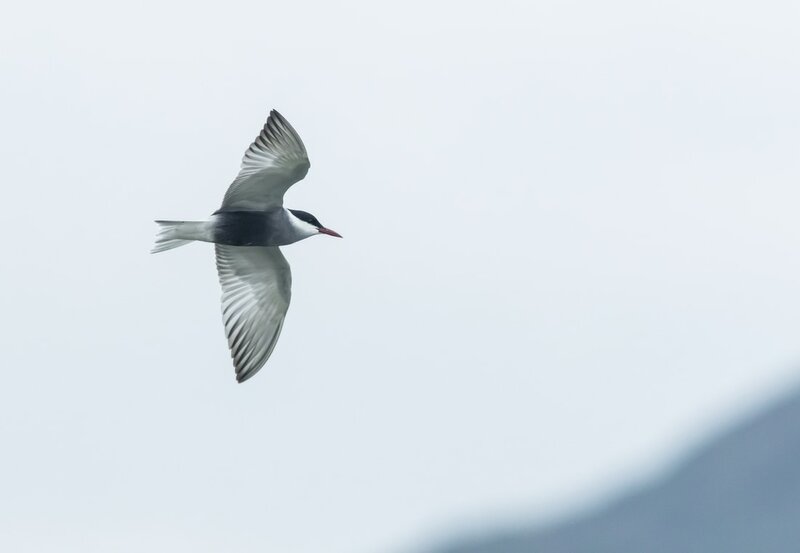 A tern survey through Tolo Harbour out to the main breeding island of Shek Ngau Chau on 13th came up with 445 Bridled Terns, including 400 at Shek Ngau Chau itself, along with 70 Black-naped Terns but only two Roseate Terns. Four Chestnut-winged Cuckoos were in the Lau Shi Heung area on 10th, as was a Hodgson’s Hawk Cuckoo. Other records of the latter species came from Tai Po Kau on 11th and Lam Tsuen on 13th. A Lesser Cuckoo was calling above Ng Tung Chai on 13th. Single Black Bulbuls, presumably late migrants, were at Tai Po Kau Headland and Po Toi on 9th. There were odd records of Arctic Warblers, Grey-streaked Flycatchers and Brown Shrikes at various localities during the week, including six Arctic Warblers in song at Cheung Chau on 10th. A Two-barred Warbler was singing at Lam Tsuen on May 10th & 11th. A chick Plain Flowerpecker that had become displaced from its nest was being fed near the ground by the adults at Tai Po Kau on 11th. This is the first proven breeding record of this species for Hong Kong. Migrants continue to be recorded, particularly at Po Toi and Mai Po. The highlight at Po Toi was a male Yellow-rumped Flycatcher on 14th; this will be only the sixth spring record of this species if accepted. Other birds on the same day included a Crested Goshawk, a Grey Wagtail, two Grey-streaked Flycatchers and two Arctic Warblers. On 16th, 20+ Brown Shrikes and a Pechora Pipit were on the island. On 20th, there were again good numbers of Brown Shrikes, as well as Yellow Bittern, Chinese Sparrowhawk, Grey-streaked Flycatcher, Arctic Warbler and Eye-browed Thrush. Ringers at Mai Po caught a Pallas’s Grasshopper Warbler in their nets on 17th. Although only a handful of other birds were trapped, a Black Bittern and a Pechora Pipit flew over. Overall numbers of waders are now much reduced, but there were at least 25 species of shorebird at Mai Po on 17th, mainly out on the mud flats, including seven Nordmann’s Greenshanks, a Little Stint and – best of all – a Spoon-billed Sandpiper. The latter bird was present on the following day. There was also belated news posted on the HKBWS website of a Spoon-billed Sandpiper on a drained pond near Mai Po on May 12th. These two sightings are the only definite records of this critically endangered species in Hong Kong this spring. Other odds-and-ends at Mai Po on 17th were a flightless Great Cormorant, 14 Black-faced Spoonbills, a Swinhoe’s Egret, a late Black-headed Gull, a Little Tern and a Pallas’s Grasshopper Warbler singing along the boardwalk. A Black-winged Kite was at Long Valley on 14th. Another Black Bittern was at Happy Valley cemetery on 18th. White-winged & Whiskered Terns continued to pass through the territory. Sixteen of the former and 13 of the latter were at San Tin on 20th, and a mixed flock of 43 was at Pui O, Lantau on 21st. And a final note on sea birds. The last couple of weekends, Chris Campion has gone out of Hong Kong on the gambling boat Star Pisces; this boat spends Saturday night in Chinese waters (where the on-board casinos can operate legally) and returns during daylight hours on Sunday morning. This allows for sea-watching on the return journey. On 14th, there were sightings of Brown Booby, two Short-tailed Shearwaters and a few terns; on 21st Chris had a Swinhoe’s Storm-petrel, a Streaked Shearwater and a Short-tailed Shearwater. Of these, only the Short-tailed Shearwater was seen in Hong Kong waters; the rest were in Chinese waters and are therefore not added to the Hong Kong records. Of particular interest is the Swinhoe’s Storm-petrel, a species which is not on the Hong Kong list. In fact, this is apparently the first sighting of this petrel at sea in Guangdong, the only other records from the province being of two birds retrieved from burrows on an islet near Nanao Island, Shantou (information courtesy of Richard Lewthwaite). Most local birders believe that the species is more frequent in waters south of Hong Kong than the above suggests, and that it may occasionally stray into Hong Kong waters. More recently, in 2000 an “unidentified Oceanodrama petrel (considered to be probably Swinhoe’s Storm-petrel Oceanodrama monorhis) was seen in the southern part of the East Lamma Channel on 30 August” and in 2012 a bird “photographed in the waters off Po Toi on 30 May was accepted as a dark-rumped Storm Petrel sp., probably Swinhoe’s Storm Petrel, although other possibilities could not be excluded” (Hong Kong Bird Reports 1999&2000, and 2012 respectively). A Tiger Shrike was photographed at Ho Man Tin on 23rd. This species is a rare autumn migrant to Hong Kong and this sighting is the first spring record for the territory. 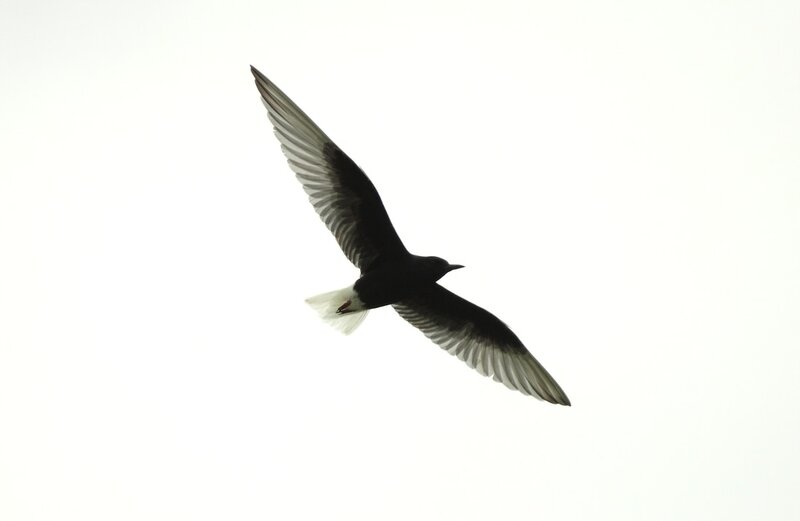 A Pacific Swift passed over Mai Po on 24th in a break during a period of very heavy rainfall throughout the territory. The heavy rain seems to have brought in some late migrants as two Watercocks and a Pheasant-tailed Jacana were in different locations at the southern end of Mai Po on 25th. On the same day, two Striated Herons, a Yellow Bittern, Arctic Warbler, Grey-streaked Flycatcher, Asian Brown Flycatcher and Brown Shrike were seen on Po Toi. Seventy Red-necked Phalaropes and 12 Whiskered Terns, plus the three local breeding terns (Bridled, Black-naped and Roseate), were noted from the ferry. On 27th, a late Blue-tailed Bee-eater was seen perched on a wire along the Mai Po access road. The mud flats still held 16 wader species including four Far Eastern Curlews, along with 37 White-winged Terns, two Gull-billed Terns and an unseasonal 2nd-summer Heuglin’s Gull. On 28th, 42 Streaked Shearwaters were seen from the Star Pisces ten kilometres east of Po Toi and a further 19 were counted in Chinese waters. A Lesser Cuckoo was heard at Tai Po Kau on 29th.